Giving you the tools you need to conceive an extraordinary child. Join Dr. Roy Dittmann, author of Brighton Baby: A Revolutionary Organic Approach to Having an Extraordinary Child for an intimate, enlightening, supportive journey into parenthood! The Inner Circle esigned to give you the tools you need to naturally conceive your own radiantly healthy baby, and to ensure that you feel confident and ready. Did you know that you can affect the health of your future child through the actions you take before conception? Did you know that everything you do health-wise after conception is less powerful than the actions you take today? Did you know that there are practical steps you can take to boost your fertility so that you can experience the joy of conceiving your baby naturally? Did you know you can reduce the odds of having a child with autism and birth defects by preparing before conception? This is the new paradigm of having truly healthy children... and Dr. Dittmann is one of the world's foremost experts. Dr. Dittmann has worked for over 30 years to create The Brighton Method – the world's first complete method for preparing to have an extraordinary baby naturally. The “Brighton Baby” Inner Circle will give you all the support you need to confidently move forward toward conception, pregnancy, and childbirth. 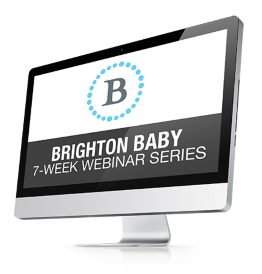 Throughout the series, you will explore The Brighton Method and begin to design your own Brighton Plan. Learn What it Takes to Have a Healthy Baby!